Best Hard Anodized Cookware For 2019 - Top Models Reviewed! →Best Hard Anodized Cookware For 2019 – Top Models Reviewed! Best Hard Anodized Cookware For 2019 – Top Models Reviewed! Durability is one of the most important characteristics of a quality cookware set. Not only does it ensure that your pots and pans work optimally for a long time, it also saves you money in the long run. Anodized cookware sets are slowly replacing ceramic ones as the ideal nonstick utensils to use in the kitchen due to their more durable finish. This article is a review of the best hard anodized cookware sets on the market together with a guide that will help you as you purchase your own utensils. Nonstick ceramic cookware sets were introduced in the market by Teflon in the 1940s. They found their way into a lot of kitchens soon after, but most customers noted that the nonstick coating wore off after a period of continuous use. Hard anodized cookware attempts to solve this problem of the durability of the nonstick layer. These utensils combine the best features of aluminum, stainless steel, and cast iron. The base metal is aluminum which is treated hydroelectrically to give it the strength of stainless steel. Passing it through this chemical bath that has an electric current also gives a layer of oxide on it. This layer serves two purposes: it is the nonstick layer that prevents sticking of food and it also prevents the corrosion of the aluminum metal below. Thus, hard anodized utensils that have a more durable nonstick coating are produced. These cookware sets were introduced in the market in 1968. The Circulon Premier is a stunning chocolate bronze hard-anodized cookware set that comes in 13 pieces. These include two covered saucepans, a covered saucepot, a covered stockpot, a 5QT sauté pan, and three skillets of different sizes. The design of the elements in this cookware set is quite impressive. Heavy-duty hard-anodized aluminum is the main metal that is used for its construction, a feature that gives the utensils their fast cooking results. The base of these pots and pans is made of stainless steel, hence enabling them to be used on induction cooktops. A 3-layer DuPont nonstick coating comprises the interior of these elements, and this ensures that your food doesn’t stick to the sides when cooking. Furthermore, this particular layering is made durable to ensure that the set serves you efficiently for a long time. The handles are also made of stainless steel and have a rubber covering. These features serve two purposes: to make the handles durable and ensures that you get a comfortable and cool grip when cooking. Another property of the Circulon Premier is that each of its pots and pans, except the saucepans, come with shatter-resistant tempered glass lids. Their transparency allows you to monitor the food without it losing its flavor while their shatter-resistant property ensures that they don’t break unnecessarily. The Circulon Premier is not perfect. The main weakness of this pan is that when washing it in the dishwasher, water may get trapped in the hollow of the handles. Furthermore, these pots and pans can only be bought as a set. There are no individualized pieces. The second item in this review and guide of the top hard anodized cookware set is the KitchenAid Hard Anodized Nonstick Cookware Set. This product has 5 pieces: a skillet, a covered stockpot, and a covered saucepan. KitchenAid comes in an elegant black color with a smooth finish on the interior and exterior. Inside, the pots and pans have a 3-layer nonstick coating that ensures that your food doesn’t stick to the sides when cooking. The added advantage with KitchenAid is that its hard-anodized nature makes it nonporous, a feature that aids its nonstick property even more. This interior coating also serves to ensure that after use, the pan or pot will be easy to clean. Another unique feature of this set is that it is dishwasher safe, and therefore doesn’t require hand washing. This hard-anodized set is made using a 5.5mm thick high-quality aluminum metal. This thickness gives these pieces a long-lasting durability that ensures you save money in the long run. Furthermore, the base of the pots and pans is made of stainless steel. They can therefore be used on gas, electric cooktops and induction cooktops. The durable KitchenAid has several weaknesses that customers have noted. First, even though it has been cleared for use on induction cooktops, it is not as effective there as it is when being used on gas and electric stoves. Moreover, if not carefully used and cleaned, the bottom and the interior may scratch. The Anolon Advanced is a hard-anodized cookware set that can be used for frying, boiling, and in ovens as well. There are eleven bronze pieces that include two French skillets of different sizes, a saucepan with spouts, two covered saucepans of different sizes, a covered sauté pan and a covered stockpot. The most impressive feature of this set is its durability and balanced heat distribution. This is enabled by the hard-anodized aluminum metal used in its construction. The manufacturers promise that this design is twice as hard as stainless steel. The interior of the Anolon Advanced is made from 3 layers of a premium nonstick layering. These three layers give this coating durability, hence ensuring that the pan will serve you effectively for a long time. Furthermore, it makes cleaning of the pan much easier. Unlike other sets in the same group, the exterior of these pans and pots are nonstick as well and set in an attractive bronze coloring. This ensures that food doesn’t stick on the outside as well in case of a spillage. The handles on the Anolon advances pots and pans are of an ergonomic and Suregrip design. The material used to make it is stainless steel covered with a layer of silicone. Moreover, the handles are riveted on the pieces rather than screwed. These features serve two purposes: to give the user a comfortable and steady grip and to provide insulation. However, even though the handles are insulated, there is a section that is partly metal. If you are not careful, this part my burn you. Furthermore, this set can only be used on gas and electric stoves. It is not induction compatible. T-Fal cooperation is one of the most respected companies when it comes to the production of cookware. Therefore, it should come as no surprise that the T-Fal E765SE is one of their high-quality products. There are 14 pieces in this set: two fry pans of different sizes, a covered fry pan, a square griddle, three covered saucepans, a covered deep sauté pan, a covered Dutch oven, and one egg wonder. Each of the pieces above is made from quality hard-anodized aluminum construction. This material provides an even heat distribution throughout the pan or pot, hence ensuring that your food doesn’t get burned in hot spots. Furthermore, the set comes with a special thermo-spot technology in the form of a heat indicator that turns red when the pan is well heated. This feature ensures that your food retains its flavor as you cook it under the ideal temperatures. Other features of the T-Fal E765SE include, first, its riveted silicone handles. The insulation of these handles using silicone ensures that they stay cool while the fact that they are fixed by riveting rather than by screwing gives them stability. These handles can be used in ovens for up to 400 degrees Fahrenheit. Secondly, the interior of the pans and pots have a titanium reinforced nonstick layering that is designed to be durable and scratch resistant. This way, you don’t have to worry that your food will start sticking after little use of the pan. The spoons that come with the set don’t scratch the interior, and would be recommended to use with the set. However, this coating wears off after a while. The lids on this set are made from tempered glass, a property that enables you to monitor what is cooking. They also have a tiny vent through which excess pressure is released from inside the pot through steam. The final item in this review of the hard anodized cookware set is the Calphalon Signature, pieces that come with a full time warranty. In this set, we have two omelette pans, two covered saucepans of different sizes, a covered sauté pan, and a covered stockpot. The most attractive feature of the Calphalon Signature is its PFOA-free nonstick interior. This nonstick coating has been designed with the properties of stainless steel and is therefore quite durable. Furthermore, it ensures that your food doesn’t stick to the sides of the pan or pot. The food you make will also be relatively free of fats and oil as you will need very little of it when cooking. Hard-anodized aluminum is used in the construction of this set. Aluminum heats up fast and evenly, hence ensures that your food cooks uniformly without having any burned parts. The handles on this set use stainless steel in their construction. They stay cool and give the user comfortable grip when cooking. The lids on the Calphalon signature are made of hard tempered glass. They serve two purposes: first, they allow you to monitor the progress of your cooking. These lids also lock in your food’s flavor and moisture, and after cooking, they keep the food warm. You can use these pieces on electric, electric ring, gas cooktop, halogen and glass stovetops. However, they are not induction compatible and can therefore not be used where the source of energy is magnetic. The cost of hard anodized cookware varies depending on the brand that you want to buy. Before going shopping for a set, determine the amount of money that you are willing and able to spend. However, be sure to consider the quality of the set that you want to buy, as sometimes cheap is expensive in the long run. As you will note from the reviews above, different brands of hard anodized cookware are used on various cooktops. Some are compatible with all types of stoves, especially the ones with a stainless steel bottom. Others are not induction compatible. Therefore, before purchasing a hard anodized cookware set, confirm that it is compatible with the method that you are using to cook. A manufacturer can promise a fantastic experience when using a particular cookware set, but ultimately, the user of the product will give you a real account. Before settling for a specific brand, go online and read the customer reviews. Be sure that the website of which you are reading the review is unbiased to ensure that your ultimate decision is well-informed. Do you have a preferred and trusted brand that you have been working with for years? Check to see whether they have a hard-anodized cookware set. However, this is not enough. See what the customers are saying about the quality and performance of the set to make an informed choice. How many people are you cooking for? What is it that you do more, frying or boiling? Before purchasing a hard-anodized cookware set, consider what you need it for. If you are cooking for a large number of people, a 5-piece set might not be ideal. On the other hand, this set would be suitable for a university student who just moved out. Furthermore, where you cooking involves more frying than boiling, a set with more pans than pots would is recommendable. A standard hard-anodized cookware set is made from aluminum. This is because the material heats up fast and evenly throughout. However, some sets may include other material including cast-iron, stainless steel or parts of aluminum. Before purchasing, ensure that any additional materials to the pieces in the set work to increase their quality. Before using it for the first time after purchasing it, clean all the pieces in the set using warm water and detergent. Rinse it thoroughly then hang it to dry. Do not season your pan before using it. This might leave an oily residue on it. Preheating should be done in low heat setting to allow the pan warm out evenly. You can slowly increase the heat as the pan heats up. You can use a little amount of oil or butter when cooking using this pan. This serves to protect the nonstick layer to prevent it from wearing off. Avoid cooking sprays as they stick on the pan and may compromise its nonstick coating. Avoid using metal utensils in these pieces, as they could scratch the interior and compromise their nonstick coating. Unless explicitly stated, do not clean these utensils in dishwashers. A dishwasher may cause warping of the metal, hence affecting its quality and durability. After washing, it is important to hang the pans and pots for them to drip water. Do not stack them, as this might cause scratching both on the lower and upper sides of the cookware. When using hard anodized cookware in the oven, ensure that you do not exceed the maximum heat limit. Q: How Is A Hard-Anodized Cookware Set Different From A Ceramic One? 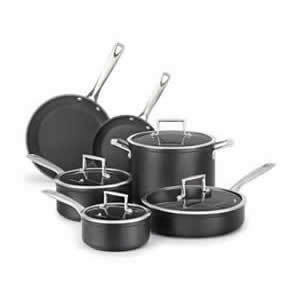 A: A hard anodized cookware set is one whose nonstick layer is as a result of the oxidation of the base aluminum metal. The nonstick coating in ceramic cookware is formed using burned clay. Q: Are Hard-Anodized Cookware Sets Safe? A: Most hard-anodized sets are free from toxic chemicals like PFOA and PTFE. The process of oxidation to form the nonstick layer is done through electrolytic conversion which is chemical-free. Q: Are All Brands Scratch-Resistant? A: No. The extent to which a brand is scratch-resistant is dependent on how it was manufactured and the density of the metal. Q: Are They Compatible With All Cooktops? A: No. This depends on the brand. Some are compatible with all cooktops while others are not. This is highly dependent on whether the set has a stainless steel base. Q: Are These Sets Dishwasher Safe? A: Some brands are safe to use in a dishwasher while some aren’t. In most cases, the manufacturer will indicate. However, to prevent warping, it is recommended that one hand washes these utensils. Hard anodized cookware is an excellent addition to your kitchen, especially considering its durability. However, not every brand in the market might be of the desired quality, and this is why it is essential to know how to make your choice, as explained above. Furthermore, their durability is dependent on how you use them, and the tips above will help you understand how to care for your set. In the review above, the hard anodized cookware set according to performance is the T-Fal E765SE. Most customers have noted its unrivaled quality in the kitchen. The Calphalon Signature is the best cookware set according to features. It can be used on a variety of cooktops and has quite the impressive nonstick coating. Best Stainless Steel Fry Pan – Guide & Reviewed by Expert!